Mathematical Psychology and Psychophysiology promotes an understanding of the mind and its neural substrates by applying interdisciplinary approaches to issues concerning behavior and the brain. The contributions present model from many disciplines that share common, conceptual, functional, or mechanistic substrates and summarize recent models and data from neural networks, mathematical genetics, psychoacoustics, olfactory coding, visual perception, measurement, psychophysics, cognitive development, and other areas. 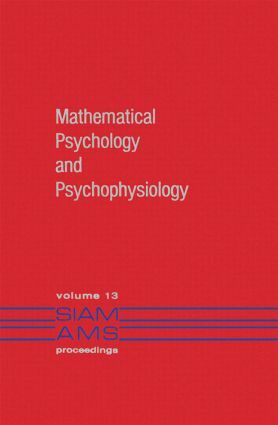 The contributors to Mathematical Psychology and Psychophysiology show the conceptual and mathematical interconnectedness of several approaches to the fundamental scientific problem of understanding mind and brain. The book's interdisciplinary approach permits a deeper understanding of theoretical advances as it formally structures a broad overview of the data. Contents: N. Graham, The Visual System Does a Crude Fourier Analysis of Patterns. G.J. Iverson, M. Pavel, Invariant Properties of Masking Phenomena in Psychoacoustics and Their Theoretical Consequences. W.J. Freeman, A Neural Mechanism for Generalization Over Equivalent Stimuli in the Olfactory System. C. von der Malsburg, D.J. Willshaw, Differential Equations for the Development of Topological Nerve Fibre Projections. G.A. Carpenter, Normal and Abnormal Signal Patterns in Nerve Cells. S. Geman, The Law of Large Numbers in Neural Modeling. S. Grossberg, Psychophysiological Substrates of Schedule Interactions and Behavioral Contrast. M.F. Norman, Sociobiological Variations on a Mendelian Theme. M.F. Norman, A "Psychological" Proof That Certain Markov Semigroups Preserve Differentiability. R.D. Luce, L. Narens, Axiomatic Measurement Theory. D.L. Noreen, Optimal Decision Rules for Some Common Psychophysical Paradigms. G. Sperling, Mathematical Models of Binocular Vision. D. Vorberg, Reaction Time Distributions Predicted by Serial Self-Terminating Models of Memory Research.